Beach County. And then my finger just stopped. Right above Boynton was a town I had never heard of – Ameron. A bit of searching in the Tropical Sun, the area’s first newspaper, revealed it to be a farming community to the north of the present day Boynton Beach. That got me to thinking – how many other towns or settlements have dissapeared or been renamed in Palm Beach County? I started a list back in November, and it has been growing ever since. The following list was compiled from many sources including the websites listed at the end of this blog posting, and the online Palm Beach Post and Tropical Sun historic archives. From the best that I can tell, this is the most complete listing of lost towns ever published for Palm Beach County. Is it 100% complete? No. I am sure I will come across more with continued research. This list does not include towns and cities that exist today. The ones listed below are either towns or settlements that have completely disappeared or been renamed, so the town’s original name appears here. If one of the entries below has dates, that indicates the years in which a post office operated. Each of these could really be a story on its own, and it provides a glimpse of the many broken dreams and abandoned places that could have been. UPDATE – March 10, 2011 – Added four additional towns – two that were planned and became Lake Worth (Lucerne and Osborne), and two towns in the Glades area (Sand Cut and Fruitcrest). Ameron (1900-1903) – Farming community of mostly tomatoes, pineapples and strawberries that was located between Hypoluxo and Boynton Beach along Lake Worth. Settlers include J.M. Carroll, Dan Smith, George Smith, S.W. Kratzer, John Griffith, Freeman Griffith, George Lyman, Frank Palmer, Charles Carroll, C. R. Baker, the Forrey Brothers and Joe Prescott. Azucar (1930-1946) – Sugar-based town with housing for workers. Mentioned in an April 7, 1938 article from the Palm Beach Post about a barbecue held there. Later it was renamed Bryant in honor of Harold Bryant (See Lucerne entry). Bacom Point (1918-1925) – Along Lake Okeechobee. Established by William “Dad” Bacom as a vegetable and catfish farm. Bean City (1936-1973) – Started by former Belle Glade mayor Arthur Wells in 1916, wiped out in 1928 hurricane, became a sugar cane area, a few buildings and residents remain. An extensive May 12, 1970 Palm Beach Post article tells the story of Bean City, which indeed, was mostly supported by green beans. Boynton (1896-1941)– Original name of Boynton Beach. Bryant (1946-1959)– Second name for Azucar settlement. Bryant was located on the east side of Lake Okeechobee near Pahokee. F.E. Bryant founded the Lake Worth Drainage District, and is for whom Bryant Part in the City of Lake Worth is named. Bryant started the Southern Sugar Company and the town was platted by the United States Sugar Corporation to house workers. All the streets and signs remain and the site can be visited today as a “ghost town”. Chosen (1921-1955) – Founded by J.R. Leatherman, a preacher from Virginia. From the Biblical reference of being the ”chosen” land. Chosen was on the site of a Calusa Indian mound which was excavated in the 1930s by the Smithsonian Institute. It was located on the east side of Lake Okeechobee and a few buildings remain. The town was destroyed in the 1928 hurricane. Connorsville/Connorstown – A September 7, 1947 article from the Palm Beach Post explained what happened to Connersville. W.J. Conners, from Buffalo, New York, bought over 12,000 acres of land in the Glades through many purchases. He built the Connors Highway toll road in the early 1920s at the cost of $2 million to the Glades, which the state bought in 1932 after Connor’s 1929 suicide. It was located on the south side of the West Palm Beach canal about three miles from the lake. Only thing left in 1947 was a well dug on the property. 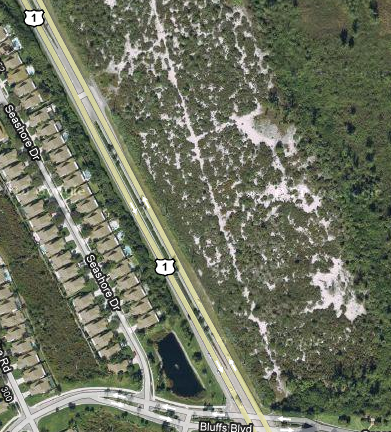 Deem City– Deem City is still listed on some maps as being on US 27 right at the Palm Beach-Broward county line. The sign said “Deem City – population 2.” There was a gas station there and a tiny house where the owner operated the Super Hamburger stand. Numerous code violations piled up and eventually the owner died. The buildings were demolished in 2008. Delray (1898-1928)– Third name of Delray Beach. Earman (1918-1923) – Earman was located near where Lake Park stands today. John Earman served as the first mayor of West Palm Beach. The family owned a hotel near West Palm Beach called The Earman House. Figulus (1886-1891) – Estate on Palm Beach owned by the Charles Bingham family on the old Potter homestead land on Palm Beach, south of the present day town. Figulus is Latin for Potter. Fort Jupiter (1855-1856) – Oldest post office and settlement in Palm Beach County by the lighthouse. Fruitcrest – Another Thomas Will dream that ended up being a nightmare. The land could be purchased at $20 an acre, but the 1928 hurricane destroyed the town, which was southeast of Belle Glade. Today the land is sugar cane fields. Geerworth – H.G. Geer and C.C. Chillingsworth bought 16,000 acres east of Belle Glade; much of the land was bought by British settlers. Continual flooding doomed the small community. Gladecrest (1915-1917) – The Tropical Sun reported on February 4, 1915 of the new town site on the Hillsboro Canal south of Lake Okeechobee. The Holland & Butterworth Company sold land claiming that one acre could support a family; it couldn’t. The peak population was 72; the town was abandoned by 1921. Golfview (1937-1997) – This small community was named due to its proximity to West Palm Beach’s first municipal golf course. That golf course eventually became a part of Palm Beach International Airport, and the municipal course moved to its present location on Forest Hill Boulevard. Airport noise caused the land and houses to be purchased by the Airport Authority. The town entry gates were moved to Yesteryear Village at the Palm Beach County Fairgrounds. 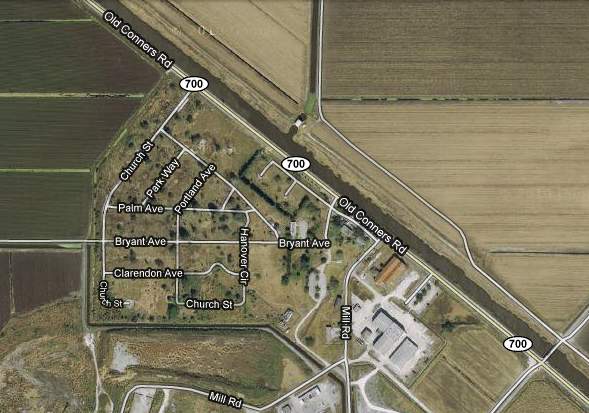 Hillsborough Canal Settlement – Original name for Belle Glade. A tourist remarked how the settlement was the “belle of the Glades” and that was chosen as the name of the new town. Hongry Land – Not really a settlement, but the area of land west of Jupiter to Lake Okeechobee. Supposedly several Seminole Indians were starving in the area during the Seminole Wars. Jewell (1889-1903)– Original name of Lake Worth, which was named to be the “Jewell” along Lake Worth. The town was changed to Lake Worth, and that has always led to the confusion between the City of Lake Worth and the body of water known as Lake Worth, which stretches from North Palm Beach to Boynton Beach. Settled by Samuel and Fannie James, Mrs. James ran the post office while Mr. James was a carpenter and farmed. The other names she considered were “Deer Park” and “La Paz” but she settled on Jewell. Juno (1890-1903) – Became Juno Beach. The town was located slightly south of present day Juno Beach. Terminal southern stop on the Celestial Railroad, the town was the county seat for Dade County from 1890-1899. Mostly pineapples were grown, and the town consisted of the courthouse, newspaper office where The Tropical Sun was published, and seven houses. The county seat was moved back to Fort Dallas (Miami) and the courthouse building was moved to Miami via a barge. The remainder of the town burned in 1899. Kelsey City (1921-1939) – Original name of Lake Park. Founded by Harry Kelsey, a Boston entrepreneur, who at one time owned 100,000 acres in Palm Beach County. Town was never built as originally planned due to the land bust in the late 1920s. Kraemer (1918-1932) and Kreamer (1932-1936) – Agriculture and fishing community on a small island in Lake Okeechobee. Damaged in the hurricanes and pretty much flooded after the dikes were built around the lake. Inlet – This reference came from a 1919 Tropical Sun article on a school census which listed children attending school at “Inlet.” My best guess is that this would become Riviera Beach, as it was called the “Inlet City”, but there may be a better answer somewhere. Linton (1895-1898) – Second name of Delray Beach, named for pioneer William S. Linton, a Michigan Congressman who bought the land and laid out the town plat. Name was changed after Linton defaulted on loans. Long Beach – Former name of Canal Point. First it was called New Town, then Long Beach, then Canalpoint as one word, then Nemaha, and finally Canal Point. See http://www.pbcgov.com/pzb/Planning/hrrb/canal_point_history.pdf for a very informative history of Canal Point. Lotus Cove – Several small articles were published in the Tropical Sun on Lotus Cove. Based on those descriptions, this is the cove north of Lantana point along the west side of Lake Worth between Lantana and Hypoluxo. Today it is considered Lantana. One of the first settlers was Edwin Bradley, who came to the area in 1877 from Chicago. Lucerne – This was a planned townsite platted by the Bryant Brothers and William Greenwood. 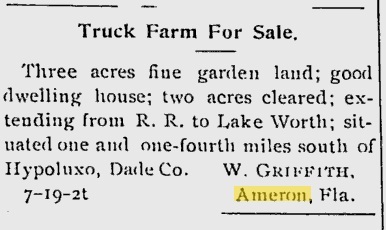 If you bought land out in the Glades through the Palm Beach Farms Company, you received a “free” 25 foot town lot in Lucerne. They held a land auction in 1912 and hundreds bought land at $250 for a five-acre plot. Of course, when they saw the land out west it was very much under water. When they went to register the name as a post office (renaming Jewel) the name Lucerne had already been taken in Florida so they settled on the name Lake Worth. The name “Lucerne Avenue” in Lake Worth is from this plan. Mabry (1922-1923) – Mabry was the original name of the settlement on Ritta Island in Lake Okeechobee. Mangonia (1894-1906) – Areas north of West Palm Beach, what would be called Northwood today. The name was derived from mango growing in the area. Mosey – This was listed on a map as being north of the then Kelsey City (Lake Park). Nothing more is known. Munyons Island (1903-1905)– Island that is now in the John D. MacArthur Park on Singer Isand. The island was originally called Nuctsachoo by the Seminoles, which means “Pelican Island” . 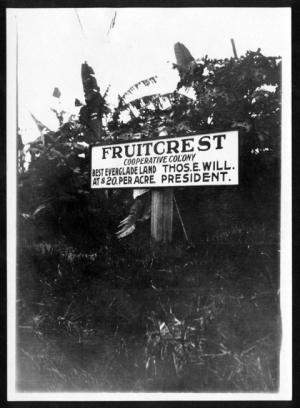 The Pitts family bought the island in 1892, built a house and grew many types of fruit. They then sold the island in 1901 to Dr. James Munyon and he built the Hotel Hygeia. Named after the Greek goddess of Health, the five story, twenty-one room hotel followed trends of the time with having spa-like hotels for wealthy clients. The cure-all was “Dr. Munyon’s Paw-Paw Elixir”, which was a patent medicine consisting of fermented papaya juice, which he bottled on the island. The hotel burned to the ground in 1917. The landing can still be seen on one side of the island. Nemaha – A platted “metropolis” as it was called in the Palm Beach Post that would have replaced Canal Point. L.M. Simons and G.A. Walker from Kansas named the city from their home county in Kansas. It was never built to their plans. Neptune (1895-1908) – The name of the post office at the Carlin Hotel and terminal north station of the Celestial Railroad. One item from the Tropical Sun mentions a wedding in the hotel at Neptune. The hotel closed after the railroad ceased operations. 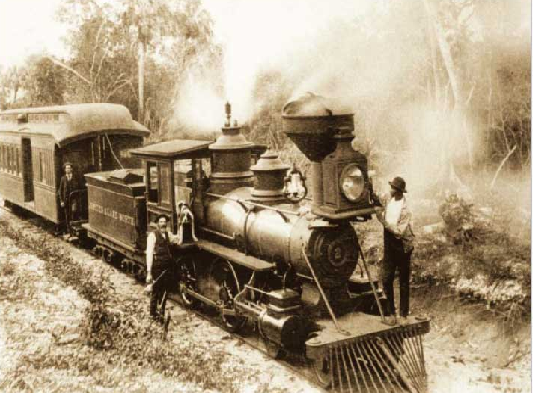 What is interesting too is that when the railroad was dismantled and sold, the right-of-way was purchased for $10.00. In subsequent years this prevented some development of the land along US 1 on the east side. The land now belongs to Palm Beach County. 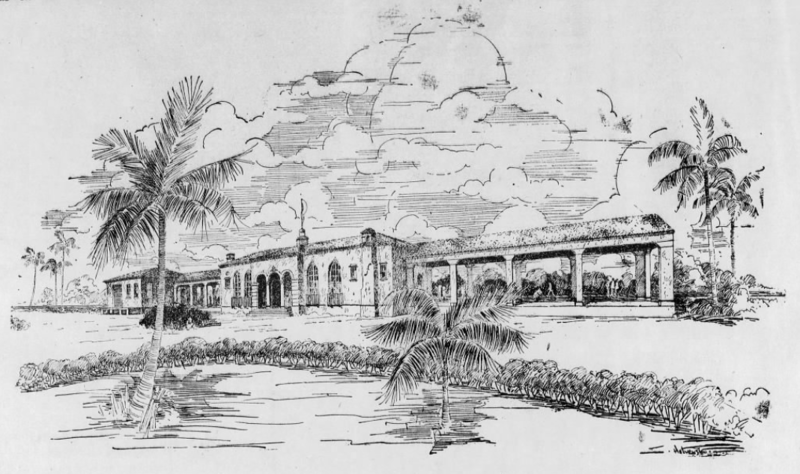 Oak Lawn (1889-1893) – Hotel and resort located where the Port of Palm Beach is today. 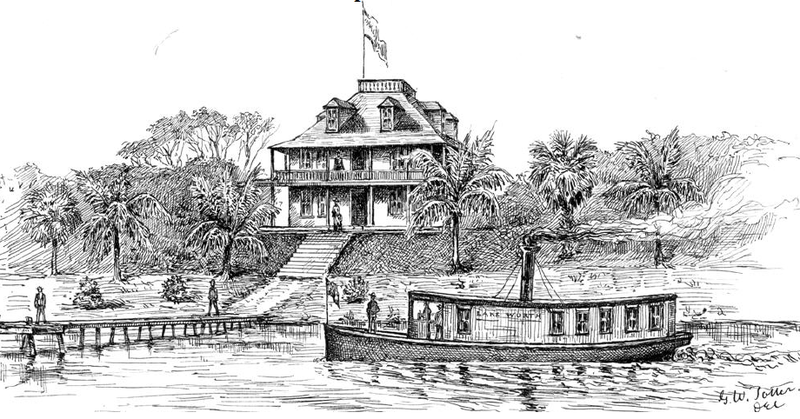 The hotel, built by Judge Allen Heyser, was situated on a very large Indian mound overlooking Lake Worth in what today is Riviera Beach. The large Indian mound was trucked away for road fill and never properly excavated. Okeelanta (1915-1929)– Okeelanta was a planned community, started in 1913 by Thomas Will. The name was derived from combining “Okeechobee” and “Atlantic.” Pioneers included R.A. Little, S.A. Hughes, Herman Walker and Lawrence Will. Despite many problems by 1920 Okeelanta had 200 residents, a school and town hall. Potatoes, corn, beans, tomatoes, and eggplant were grown and shipped north via a packing house that was located at where Southern Boulevard and I-95 are today. Okeelanta was flooded and destroyed by the 1928 hurricane. Thomas Will attempted to rebuild the community, however due to lack of financial backing The Okeelanta Corporation declared bankruptcy. Palm City (1887-1887) – Original name of Palm Beach – had to be renamed as there was already a Palm City. There is also a Palm City in Martin County that still exists. Paso Robles (1920) – This town to be was the brainchild of Marshall Hartman – at least that was the name this schemer used. He bought a tract of land north of Boynton west of the Federal Highway on a mortgage, sold lots at a big event, pocketed the money, and skipped town. Pelican Lake (1939-1964) – Also called Pelican Bay, this little community on Lake Okeechobee had hundreds of deaths from the 1928 hurricane. Newspaper articles from the time speak of finding 200 bodies one day, and 200 more the next. In 1932 a farmer’s cooperative purchased 1,000 acres of land from the state under the name Pelican Lake Farms, Inc. Newspaper accounts tell of the boxcars full of beans grown in the area that was taken north to sell. I think most people who worked the farms lived in Pahokee. Plumoses City – This was an off-shoot from Jupiter where in 1929 residents along Center Street resented the town’s taxes so they formed their own town. It was abolished in 1959 and again is a part of Jupiter. The name came from the ferns that were grown for the floral industry. Prairie – This was a small community located where the RCA buildings are today on PGA boulevard. It was a saw mill and was listed in the 1919 school census. Ritta (1912-1931) – An island at the southern end of Lake Okeechobee. 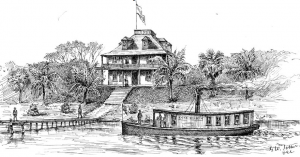 The Ritta Hotel was located there and owned by Richard Bolles, the Everglades land speculator who sold swamp land to thousands of unsuspecting people at his March 1911 land auction The island was covered by custard pond apple trees which were cleared for farming. All the buildings were destroyed in the 1928 hurricane. Riviera (1919-1942) – Original Name of Riviera Beach. 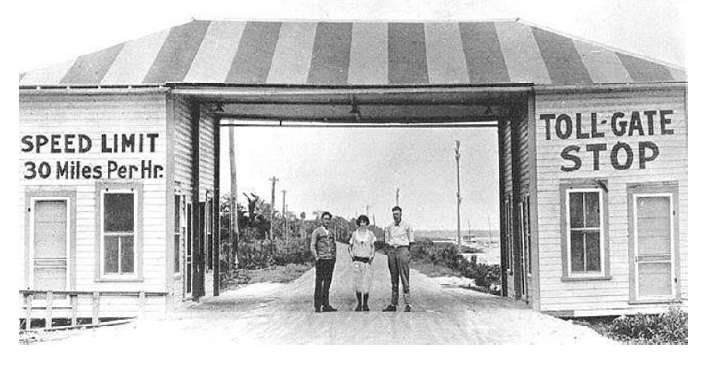 Rood (1915-1934)– The Rood family moved from Wisconsin and bought a 20 acre tract in the Philo Farms district west of Jupiter. Mrs. Rood ran the small post office, and the family took mail all the way out to Indiantown along the old Jupiter Grade road. Edgar Philo had subdivided the land and ran a small hotel on the property. Sand Cut – This tiny migrant village town was recently vacated to allow expansion of the dike surrounding Lake Okeechobee. It was located on Connors Highway (US 98) north of Canal Point. Scratchankle – Another Lake Okeechobee settlement founded by John Tyner in 1912, and sometimes called Tynersville. 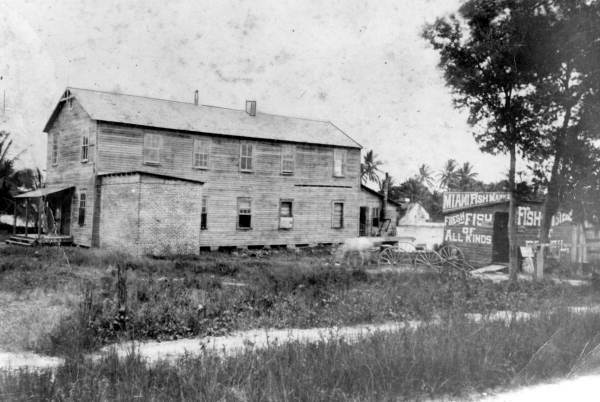 Shawano Village – A small farming community that was southeast of Belle Glade, sometimes called “Brown’s Farm.” It was a large peanut farm founded by the Brown Paper Company of Portland, Maine in 1924. The company suffered through the Depression and the village was dissolved in 1931. Torry Island (1917-1921) – One of three islands in southern Lake Okeechobee with Ritta and Kreamer. It was covered with the same Pond Apple trees which were cleared for farming. The Cromartie family were among the first pioneers. Ivey Cromartie went on to marry Frank Stranahan, the modern founder of Fort Lauderdale. 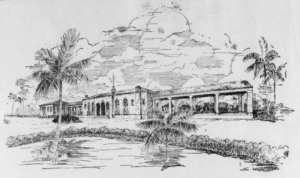 Tustenegee (1877-1879) – The earliest post office in Palm Beach, before there was a Palm Beach. In all likelihood a Seminole Indian word meaning warrior. 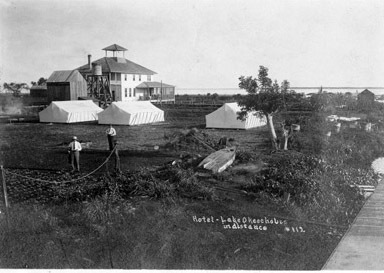 Utopia (1910-1917) – Small farming community on the north side of Lake Okeechobee. The community became a part of Okeechobee County in 1917 and vanished in the 1928 hurricane. Venus – Stop on the Celestial Railroad. J.B. Wells and his three cats were the only residents by the loading platform – primarily a pineapple growing region. Town was platted in 1893, but no lots ever sold. Now part of preserved lands. Villa Rica (1925) – This was to be the northern neighbor to Boca Raton, a grand community planned by developer George Harvey. It was platted just north of Yamato Road along Old Dixie Highway. The land bust did it in. The name can still be seen on the FEC Tracks on a train service facility. Wyman (1902-1907) – The area north of Boca Raton had a post office. This same land became the Yamato Colony. Nearby Lake Wyman retains the name. 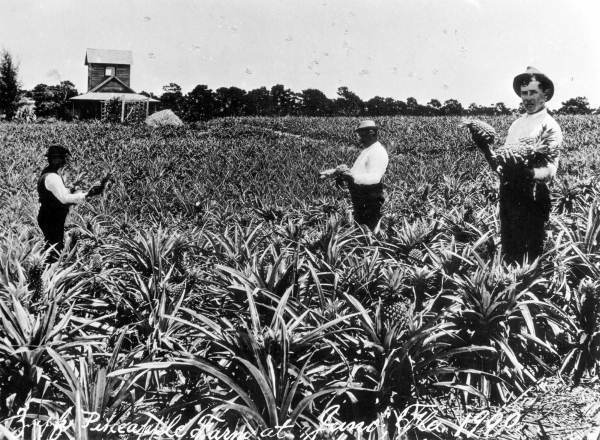 Yamato (1907-1925)– This colony of Japanese immigrants farmed pineapples and vegetables. Most of the settlers returned to Japan. One who stayed was George Morikami, who bought land west of Delray Beach and donated the land to the county. Much of the eastern lands became part of the Army Air Corp Base at Boca Raton. 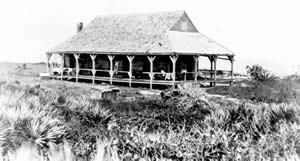 Zion (1888-1892)– Original Name for Delray Beach – the Orange Grove House of refuge was manned by several keepers over the years. Annie Andrews served as post mistress and the post office had two patrons – Annie and her husband! www.ghosttowns.com – Great website for ghost town information. www.postalhistory.com– Website that had a very comprehensive lists with dates of the former post offices in the county – thanks to Janet DeVries at the Boynton Beach Library for the link. http://www.pbchistoryonline.org – Lots of information on Palm Beach County history. Thanks also to Janette Campbell, a native of the Glades, who helped out with some of the Lake Okeechobee entries.